I’M READING “THE OTHER YOU” TO MY FRIEND WHO IS LOSING HER SIGHT. SHE HAS SUCH PRAISE FOR YOUR WRITING. SHE SAYS SHE CAN SEE THE SUNSETS AND SCENERY AND FEEL THE EMOTIONS OF THE CHARACTERS. I’M REALLY ENJOYING THIS SECOND TIME AROUND ON THIS BOOK. READING ALOUD MAKES QUITE AN IMPACT. THANK YOU MARION FOR SHARING YOUR TALENT. GOD BLESS. For quite some time now, it’s been at the back of my mind to investigate going audible. But there’s always another book to write, always another deadline to meet, and there just didn’t seem time to venture off in another direction. Besides, it had to be a costly exercise, which I likely couldn’t afford. And even less so with our weak currency in South Africa. But when I got my cousin’s message, I realised I needed to give publishing my books in this format some thought. AND, in my investigating, I read two words that were magic to my ears… Royalty share. So a few days ago, I took the time to look into this and promptly got discouraged. It appeared I couldn’t publish through ACX (Amazon’s audible arm) because I don’t live in the USA, Canada, UK, or Ireland. ACX was my only option for royalty share but because I live in South Africa, I couldn’t do it. I went from webpage to webpage and the myriad of options to produce a book on a “per finished hour” fee basis. I got even more discouraged. I tried local options. Sigh, they were as unaffordable as using an overseas production company. I was at my wits end so I emailed ACX telling them I had everything they required—an ITIN number, an American bank account, and I now also had a postal address in the States (one of my author friends had told me how to do this…*thanks, Autumn*). I had to have all these things things (besides the postal address) to be able to publish on Amazon anyway, and as ACX is part of Amazon it just didn’t make sense that I could publish in eBook and print, but not audible. Just before I got a response from ACX, I noticed some small print in one corner of their webpage that said something to the effect that if I had the US Tax number, bank account, and address, I could still sign up with ACX even if I didn’t live in the “magic” countries. All I had to do was tick the box stating I lived in the US. In no time at all, I had my own ACX account, I’d uploaded a sample for narration, had listened to various voices, narrowed those down three women with the British voice I was seeking, and emailed them. On top of that, my book was available for auditions from other narrators. A few hours later, I got a response from one of my shortlisted ladies saying she’d love to work with me. The next day I had her sample narration back and absolutely loved what she’d done. Her spoken word simply brought my story to life. I promptly signed her up, and a few days ago received the first 15 minutes back from her for approval. If all goes according to plan, the audiobook will be complete by the end of October and for sale early November. 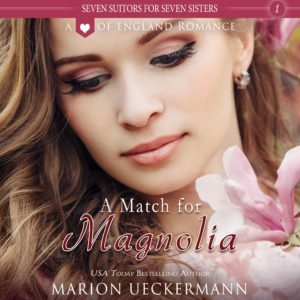 I chose A Match for Magnolia as my first audiobook. It’s Book One in my Seven Suitors for Seven Sisters series which is set in England, and I have plans to turn each of the books into stories my readers can just close their eyes and listen to, or play while commuting if they so wish. My narrator, Lin Gallagher, is doing a sterling job, and I couldn’t be happier with the way going audible is turning out. I also plan to spend more time appealing not only to readers’ sense of hearing, but their visual senses, too, by doing more book trailers. Attached are three of the five sample pieces Lin narrated for A Match for Magnolia. 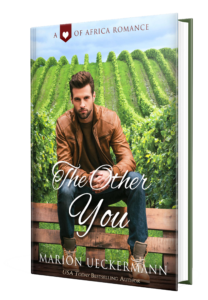 And you can watch my new book trailer for The Other You on YouTube (just click the hyperlink on the title). So what about you? Do you love audiobooks? Hate them? Never tried them? And what about book trailers—would they influence your reading choices? MARION UECKERMANN’s passion for writing was sparked when she moved to Ireland with her family. Her love of travel has influenced her contemporary inspirational romances set in novel places. Marion and her husband again live in South Africa, but with two gorgeous grandsons hanging their hats at the house next door, their empty nest’s no longer so empty. Hope you get to try it sometime (and not because of failing eyesight :) ). It’s definitely a great option with the busy lives people lead. Yes, it’s so important to choose a narrator that matches with the storyworld and characters, but that readers can still understand. I hope your mother-in-law gets to listen to A Match for Magnolia when it releases on audio. I’ve tried audibles a few times, but always get interrupted. I hear you, Lucy. I think it definitely is far easier to get interrupted in a book, than with an audible book. I have never tried audible books. I love to read a book so I am not sure that audible books are for me. I started listening to the Bible – tapes until I wore them out and got CDs, then MPs. A couple of years ago, I started listening to outstanding Christian romances by Lea Atwood, Valerie Comer, Lacy Williams and Staci Stallings. I have about 20 of them and hardly a day goes by that I don’t listen to them, at home or on the go. A Match for Magnolia is without a doubt my favorite book of yours. Excited to find out there’ll be an audio book! I’m glad to hear you’ve enjoyed my audiobooks! So glad you love audio books, Anke. Great collection of authors you’re listening to. 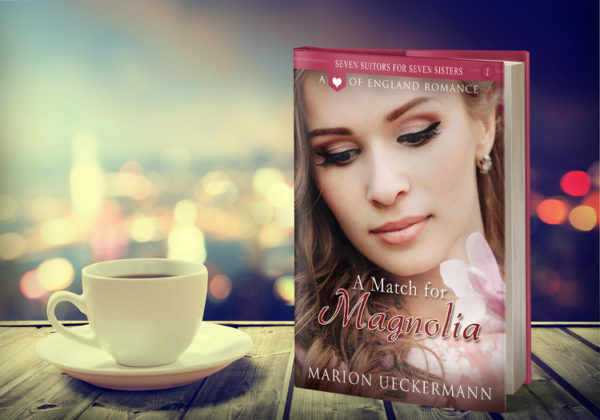 Hope Magnolia’s story becomes part of your collection. wow what an ordeal to go through. Am so glad you were able to get it all straightened out. I personally do not care for audio books. I like to concentrate on what I am reading with no noise. I am also one of those people who constantly turn back to pages to clarify something or to make sure I read it right the first time around. I found I can do neither with audio. And when I am doing housework or sewing I listen to music. LOL, yes, I lost a day or two, Lori, but it all turned out well in the end. Audiobooks are certainly not for everyone, but I’m glad that it’s possible for authors to be able to cater for those who do love them. I loved your stories and am sure people will enjoy it. I’ve started listening to audible books after reading some of Valerie’s posts and I’ve bought a few other books. It’s still not my favorite kind of “reading” because I don’t feel I have a full experience (change pace whenever I want, re-read, highlight, etc), but it’s a good way to get some of my reading done while working (usually house work when my son is sleeping). I also have a hard time with narrators, but I enjoyed your samples. Having read A Match for Magnolia, I can see it would be an enjoyable “read”. I have to confess getting a free audiobook (Dandelions for Dinner) was a good incentive to download audible.. then from there, I actually tried a few others. I still prefer my ebooks, but I’ve learned to enjoy the audio versions. For certain it’s a good way for busy people to read. So glad you loved the samples. I feel so blessed to have gotten the narrator I did. Welcome to audio, Marion! When I started, there was no option to set things up as an American if you weren’t under their tax laws. Most of my audiobooks are done through my previous small press publisher in the US, to whom I signed audio rights, so she’s handled those for me until now. The audiobook of mine that just released (Butterflies on Breezes) is the last one under that system. ACX made arrangements in Canada just after that contract was signed, and my next one, Memories of Mist, which is currently under production, is being set up under my own name in Canada. It does get complicated!!! As a consumer, I’d never listened to audiobooks before starting the process as an author. But I’ve found I actually quite enjoy listening to them when I’m in the car by myself (not that often) or working in the yard/garden, cooking, cleaning (except for the vacuum, LOL), and – lately – while canning tomatoes. Thanks, Valerie. I’m excited to start down this road. Almost feels like I’m suddenly bringing my stories to life. Yes, even a South African audible producer I contacted to get a quote was surprised that I had managed to publish with ACX, but I did get the email from them that I was in fact able to do that, and I got my account up and running with them. Just shows it pays to read the fine print (or the print that seems hidden from sight LOL). I haven’t ever viewed a book trailer and it’s been a LONG time since I’ve listened to an audiobook. I need to give both a try! I hope you get to do so soon on both, Ellie :) For book trailers, the link to The Other You is highlighted in red on the 3rd last line of this blog…you could start there :) I also have another book trailer for my first book, Helsinki Sunrise, set as the timeline image on my author Facebook page (https://www.facebook.com/Marion.C.Ueckermann) – you could watch that one, too. Both are very different … Helsinki Sunrise has moving people on it (thanks to the fact that my son and his wife were my cover models and he filmed and put the video together for me), and The Other You is done with still images. Valerie Comer also has a great one done in a totally different format on her website. I listen to a lot of sermons and Bible studies through podcasts and audiobooks. I occasionally listen to fiction audiobooks. The main pro is that I can clean my house or quilt while listening. There are several reasons I don’t like audiobooks for fiction. Sometimes my mind trails off while listening. I may miss something crucial to the plot if that happens. Also, I love reading through the kindle app on my iPad. Using my iPad, I can do a search through the book if a person is mentioned but I can’t remember who that person actually is. (Ok, my memory is lousy!) I can also get definitions of words I’m unsure of and translations if a foreign phrase is used. If a book starts the chapter with headings of a time and/or place, I can highlight those and quickly and easily refer back to it through the list of highlights. However, I do think it’s a great option for those with long commutes or bad eyesight and those who just prefer audiobooks. I’ve listened to some audiobooks and I liked them. But I guess it depends on the narrator.. I’m glad yours is working! I don’t think audiobooks replace a book in itself as I don’t think e-books totally replace paper, but they sure have their place in reading. There still is nothing like that paperback … but as you say, paper, digital, and audio all have their place, and definitely their own reader groups that prefer them (and hopefully somewhere inbetween, readers that want all three). I absolutely love audio books! I listen almost daily in the summer when I’m outside working at home on our ranch. Wonderful that it worked out for you! This is a great narrator! I am an avid reader, but have never tried audio. After reading these comments, I do plan to try audio. Thanks for an interesting post. Hope you do, Jackie, and glad you found the book interesting. I think if one’s a slow reader (as I am), this is also a good way to go. I was surprised to find in going on this audio venture that Magnolia is only a 3 hour read – golly, it took me days, but then, I was proofreading LOL. I have been thinking about audible books. When I was traveling for work,I listened to books on tape but now I am retired. If my vision gets any worse,I will give it a try. How exciting Marion to see your books in audio version! I know a lot of authors are going that route to reach more readers. With so many people who commute for work or pleasure, it would be perfect for them :-) I’m not an audio book fan myself, I prefer to hold & read a real paperback. But I still think it’s pretty cool that both authors and readers have more options these days. As for book trailers, I’ve seen a few and I think they’re pretty neat. It always gets me excited for a new book! Thanks, Trixi. It is pretty neat that we’re able to reach readers where they’re at with all these different mediums. I love audio books when I’m busy in the kitchen, cleaning, or sewing. I’m almost finished listening to To Wager Her Heart now. I have several audio books that I have listened to again and again, and would listen to them more if I didn’t have several to still get to. I have loved everything that you have written, but have never listened to your audios. I may have to change that. Whoo-hoo … another audio fan. Well, A Match for Magnolia will be my first audio. Hopefully the rest of the series will follow soon :) And I hope you’ll get to hear them as well as having read them. I used to listen to audio books as a kid but not anymore.